Proficient with many handgun based weapons, such as gas guns and wirepoon guns. 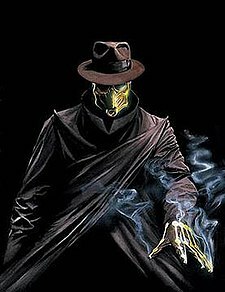 Sanderson "Sandy" Hawkins, formerly known as Sandy the Golden Boy, Sands, Sand and eventual successor of his mentor Wesley Dodds as Sandman, is a fictional character and a superhero in the DC Comics universe. Created by writer Mort Weisinger and artist Paul Norris, he first appeared in Adventure Comics #69. After being unutilized for several years, he was reintroduced by writers David S. Goyer and Geoff Johns in the comic JSA in the late 1990s and with a greatly expanded set of powers and responsibilities. He eventually became a new version of his former mentor, donning the identity and costume of Sandman. The character of Sandy the Golden Boy was created as a sidekick to the Sandman. Created by Mort Weisinger and Paul Norris, the nephew of The Sandman's girlfriend Dian Belmont, the character debuted as a tights-wearing youth (in the same vein as Robin the Boy Wonder) in Adventure Comics #69 (Dec 1941). This same issue also showcased a new yellow-and-purple costume for The Sandman. The flourish of mystery-men comic books came to an end in the late 1940s. About ten years later DC Comics reintroduced some of the mystery-men characters in new books, but reimaged them as super-heroes, characters such as Green Lantern and Hawkman. September 1961 saw the publication of "Flash of Two Worlds" in The Flash #123. This was the first new story using an original mystery-man character, namely, the Flash (Jay Garrick). The concept of an Earth-1 and Earth-2 began to be developed and soon other 1940s characters were being used in modern stories. Sandy the Golden Boy was reintroduced to the public by writer Len Wein in Justice League of America #113 in 1974. Len Wein wrote of his inspiration in the compilation book Crisis on Multiple Earths Volume 3 (2004): "I had always been a fan of the Golden Age Sandman, and had always wondered why he'd been put back into his double-breasted Man of Mystery Gas-Mask outfit when he was revived, instead of the more traditional purple-and-yellow super-hero costume he'd worn in the latter days of the 1940s. This would make the perfect place to find out. Thus was born The Creature in the Velvet Cage." In this story, it was revealed that in the 1940s Sandy had been transformed into a huge, sand-like creature when an experimental weapon Sandman was testing exploded. Wracked with guilt, Sandman stopped wearing the costume he'd worn as Sandy's partner, and went back to his original outfit. The transformed Sandy had been kept in a glass cage for decades. In a later story (DC Comics Presents #47, July 1982), Sandy was finally turned back into his human self, and found that he hadn't aged in all that time; physically, he was still a teenager. The 1980s saw writer Roy Thomas' World War II era series The All-Star Squadron (pre-Crisis) and the Young All-Stars (post-Crisis). Sandy was brought into the Squadron storyline during the Crisis crossover, beginning with issue #51 (Nov 1985). That book soon ceased printing and was replaced by the Young All-Stars (June 1987) where Sandy played a role in issues 2 through 8. This series states that Sandy is fourteen going on fifteen in the spring of 1942. Also written by Roy Thomas, the one-issue special Last Days of the JSA published in 1986 depicts the departure of the JSA characters. Although taking place in the modern era (within weeks of the Crisis), Sandy is still depicted as a teenager wearing his World War II uniform of yellow-and-red. The story relates how he and other JSA members are taken into Ragnarok where they must fight forever. Published in 1992, the Armageddon Inferno miniseries written by John Ostrander takes the JSA members out of Ragnarok and brings them back to Earth, allowing writers to use them in future stories. Sandy is one of these characters. The 1999 series JSA was preceded by a JSA Secret Files special. The special and the series reintroduced Sandy, but now as a young man calling himself Sand. This new and further development of the character was written by James Robinson and David S. Goyer. Issue 18 of the series, written by David Goyer and Geoff Johns, introduced retconned history for the character including his "killing" of Johnny Sorrow in 1944. The JSA–JSA storyline has Sand time travel to 1951 and interact with The Sandman; writer Geoff Johns states the present-day age of the character as being "biologically 25," but his birth year is changed to 1926 (Roy Thomas had given the character an age of 14 in 1942 making the birth year 1928), the "Velvet Cage" story from the 1970s is also referenced and rewritten to an extent, the year of the silicoid accident is changed from 1947 to 1945. Issue #83 (2006) is part of the One Year Later reboot of the DC comics line; in this issue written by Paul Levitz, Sand is no longer shown as a member of the JSA. Sand makes no more appearances in the series which ended with issue #87 (2006). This book debuted in February 2007, written by Geoff Johns. The cover of this book shows the round table of the JSA surrounded by 17 heroes including Sanderson Hawkins, now wearing a black cape and fedora reminiscent of the original Sandman, but also gloves and a mask unlike any other incarnation of Sand or The Sandman—it appears to be a cross between the masks of Hawkins & Dodds, and mixed with designs borrowed from the Helm of Dream of the Endless. According to Geoff Johns' interview in Wizard #180 (October 2006) Sand would become the JSA's "Recon Man" doing more detective work in the process. He was brought in on issue #3, appearing in a cloud of smoke and speaking of nightmares, attributes more recognizable of Wesley Dodds than for Sanderson Hawkins. Issue #5 shows this version of Hawkins as more sober and serious than previous incarnations. For about a year the character was not used in the series, nor were his face and name shown in the JSA roll call found framing the main story pages. He was not seen again until issue #14 (2008) where Johns portrayed him as tormented by perverse and horror-filled nightmares. Sandy Hawkins has briefly appeared in a few episodes of the Cartoon Network animated series Justice League Unlimited. He was seen in his Sand persona making notable cameos in the stories "Initiation," "Clash" and "Panic In The Sky." His powers and origin are presumed to be the same as his comic book counterpart. On Legends of Tomorrow, his mask is in Rip Hunter's office. An alternate unnamed version of Sandy Hawkins was seen in Justice League: Crisis on Two Earths. He is seen as a member of the Crime Syndicate of America where he is part of Superwoman's faction. Sand was included as an action figure in Mattel's Justice League Unlimited toyline in early 2007. ^ L. Wein (21 May 2013). Crisis on Multiple Earths Vol. 3. DC Comics. p. 5. ISBN 978-1-4012-4583-2.